I’m the type of person who could just eat marinara sauce with a spoon. I love it just that much. BUT that feels kind of weird so I try to find other vehicles to slather with the yummy sauce. Sure, there’s always pasta, but there are so many other options! This week I found eggplant on sale for $1.29 each (instead of per pound, which makes it a great deal! ), so I cut them in half, roasted them until they were rich, tender, and caramelized, then piled an awesome homemade meat sauce on top. 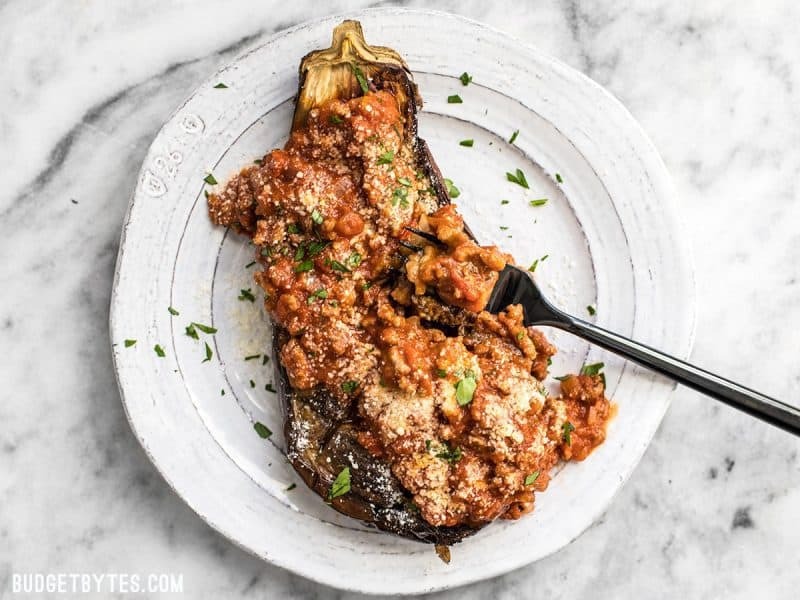 This Roasted Eggplant with Meat Sauce is SO GOOD. 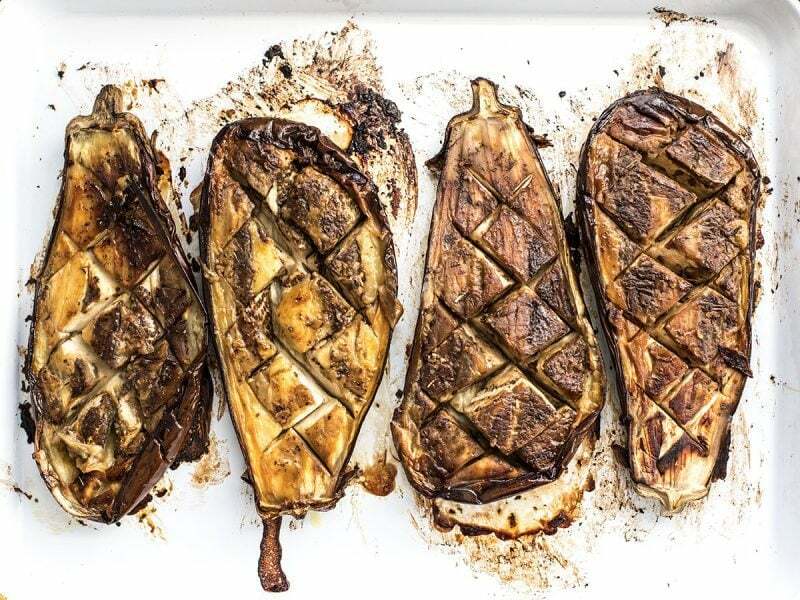 Roasting eggplant does take some time (about an hour), but that’s all hands off time, so this is still super easy. 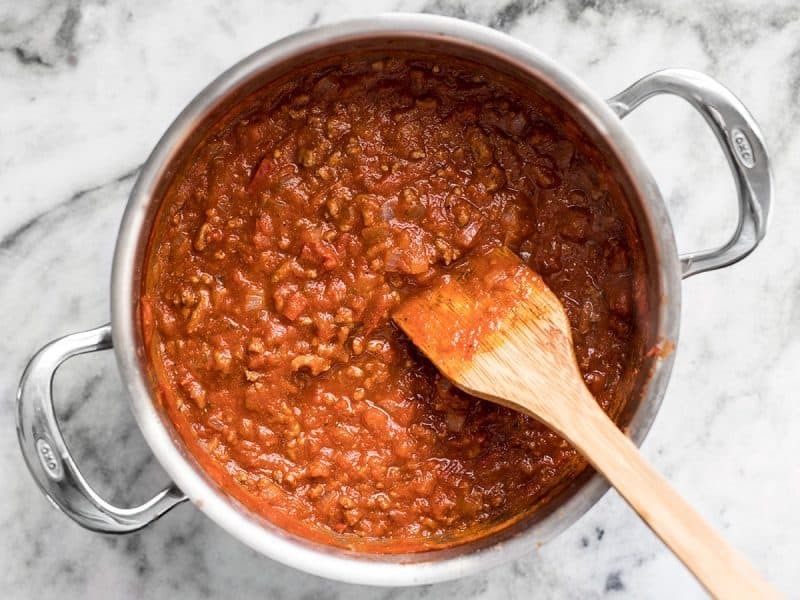 If you want to make it even easier, you can always sub the homemade meat sauce for your favorite jarred sauce, but I just want to stress how easy the meat sauce is to make yourself. Seriously easy. So easy that I might just be making it like once per week to keep on hand to pour over whatever roasted vegetables I happen to have that week. Don’t want to do a meat sauce? Sautéing some minced mushrooms is a really good alternative. It will give your sauce more bulk and keep this more of a main dish than just a side. Just make sure to cook those mushrooms down until the liquid in the pot dries up and you start to see some browning action. The browning is where you’re going to get all the flavor. 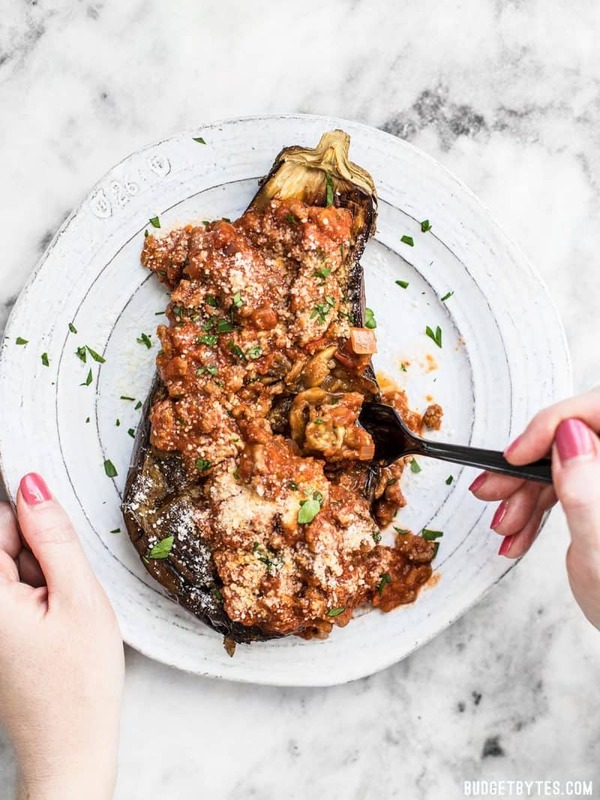 Roasted Eggplant with Meat Sauce is an elegant low carb main dish that will leave you satisfied. Pair with a simple green salad for a complete meal. Preheat the oven to 400ºF. In a small bowl combine the olive oil, minced garlic, Italian seasoning, and salt. 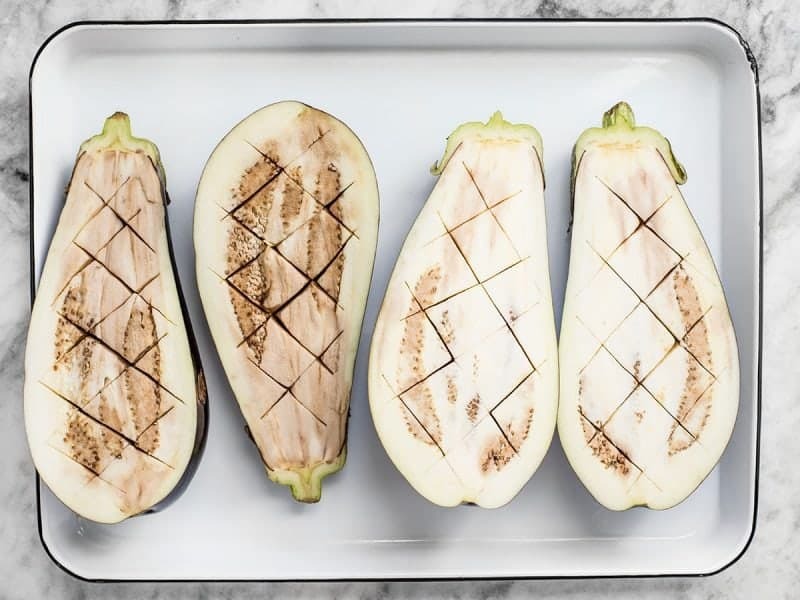 Slice each eggplant in half lengthwise, then use a paring knife to score a crosshatch pattern into the flesh (do not pierce the skin). Drizzle the seasoned olive oil over the cut surfaces of the eggplant and smear it around with the back of a spoon. 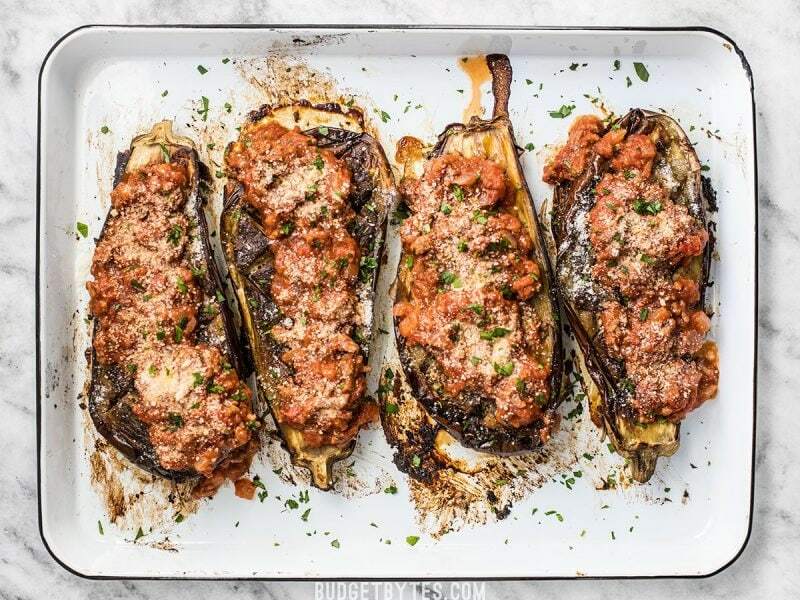 Place the eggplant on a baking sheet, cut sides down, and transfer the baking sheet into the oven. 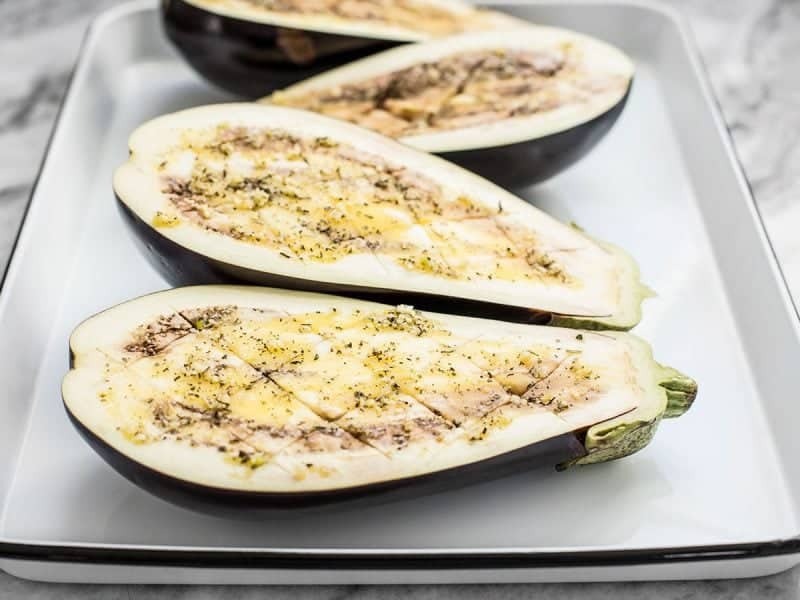 (Coat the baking sheet with non-stick spray for easy cleanup) Roast the eggplant for about 60 minutes, or until they look deflated and the skins appear wrinkly. 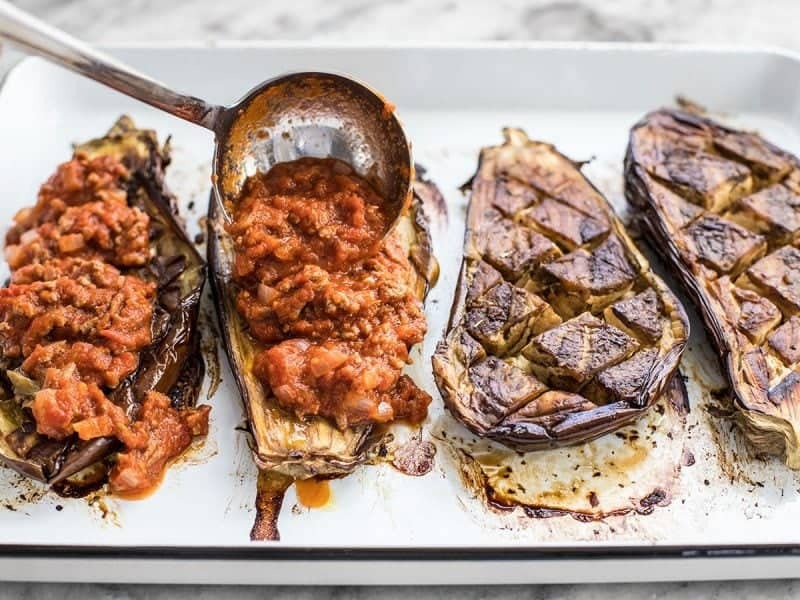 While the eggplant are roasting, prepare the meat sauce. 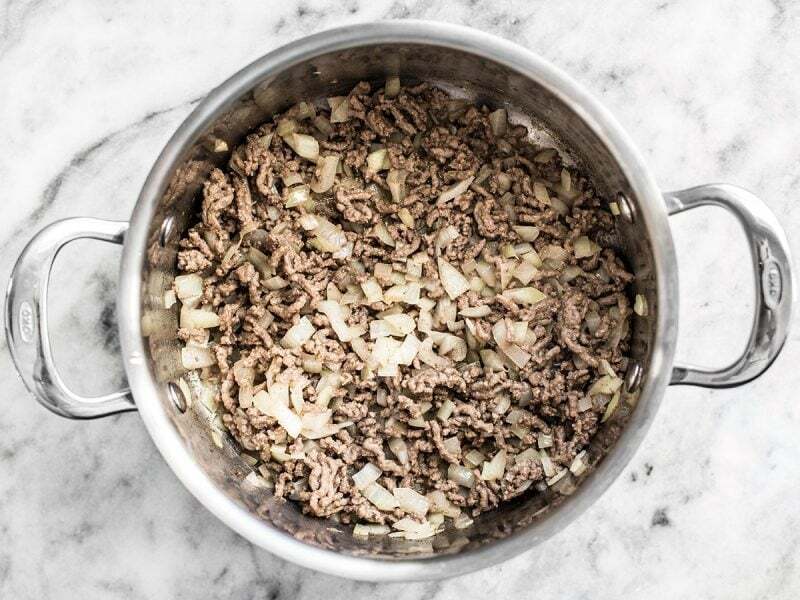 Add the ground beef and olive oil to a sauce pot and cook over medium heat until the meat has browned. If using a higher fat content beef (90% lean or lower), drain the excess fat from the pot. Dice the onion and add it to the browned beef along with the butter. Sauté over medium heat until the onions are soft and transparent. Add the crushed tomatoes, Italian seasoning, and some freshly cracked pepper. Stir to combine, then allow the sauce to come to a simmer. 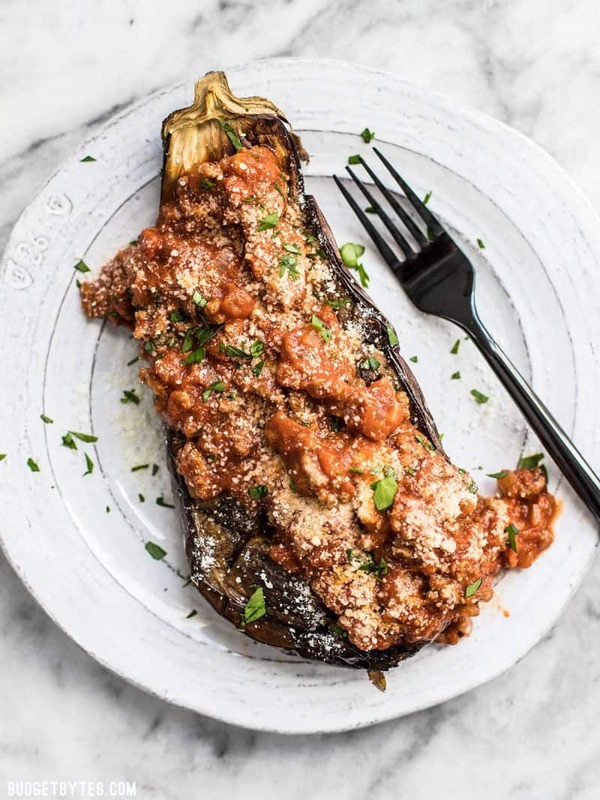 Once it reaches a simmer, turn the heat down to low and let it simmer until the roasted eggplant are finished, or for a minimum of 30 minutes. Before serving, taste the sauce, and add salt as needed (about 1/2 tsp). 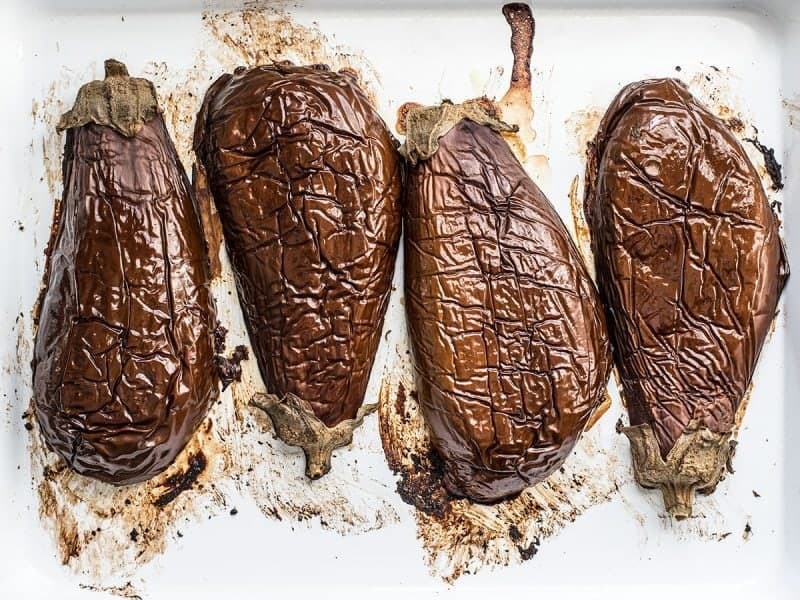 When the eggplant are finished roasting, carefully flip them with a spatula (they will be quite soft). 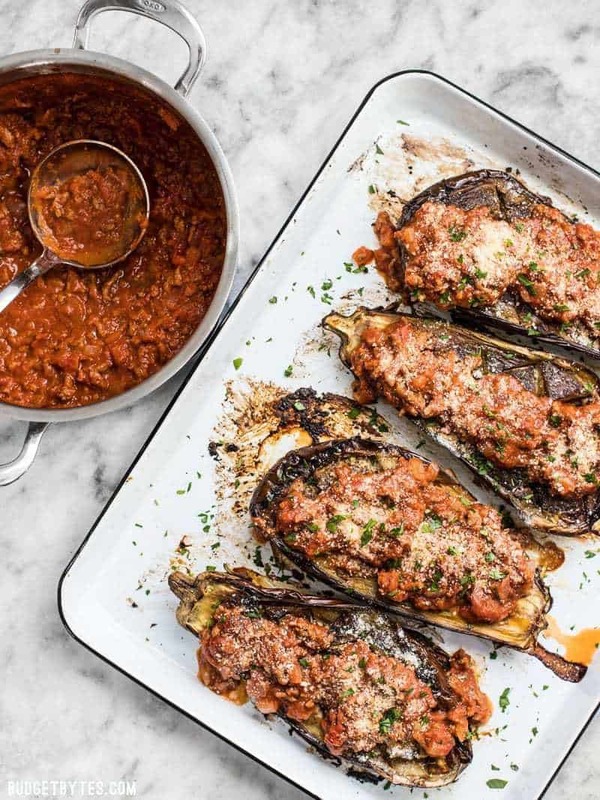 Top each eggplant half with a generous ladle of the meat sauce and a dusting of grated parmesan. Serve immediately. Preheat the oven to 400ºF. 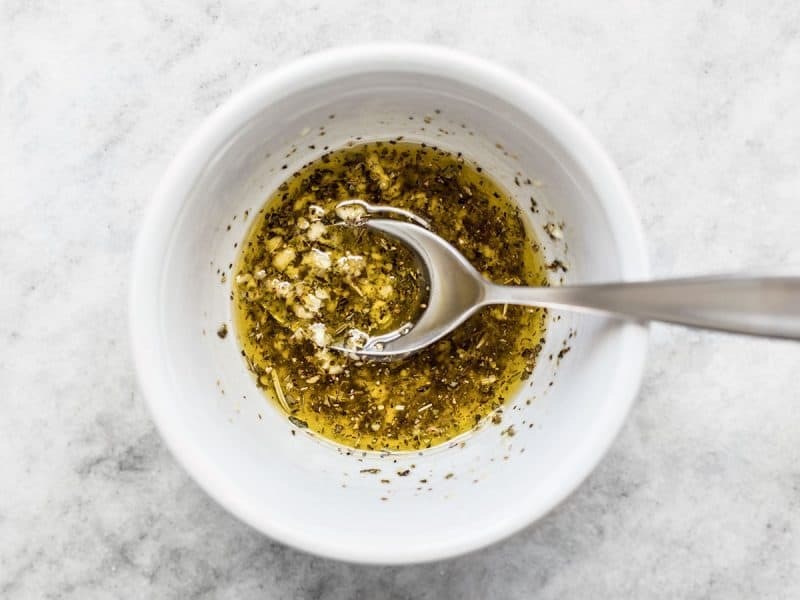 In a small bowl combine 2 Tbsp olive oil, 2 cloves garlic (minced), 1/2 tsp Italian seasoning blend, and 1/4 tsp salt. Slice two eggplant in half lengthwise, then score a crosshatch pattern into the flesh (avoid piercing the skin). Place the eggplant on a baking sheet, cut side up. Drizzle the seasoned oil over the cut surface of the eggplant and smear it around with the back of a spoon. Flip the eggplant over so the cut side is down. This holds in the steam as they roast and helps soften the eggplant. A little non-stick spray on the baking sheet helps keep the eggplant from sticking and makes cleanup a little easier. 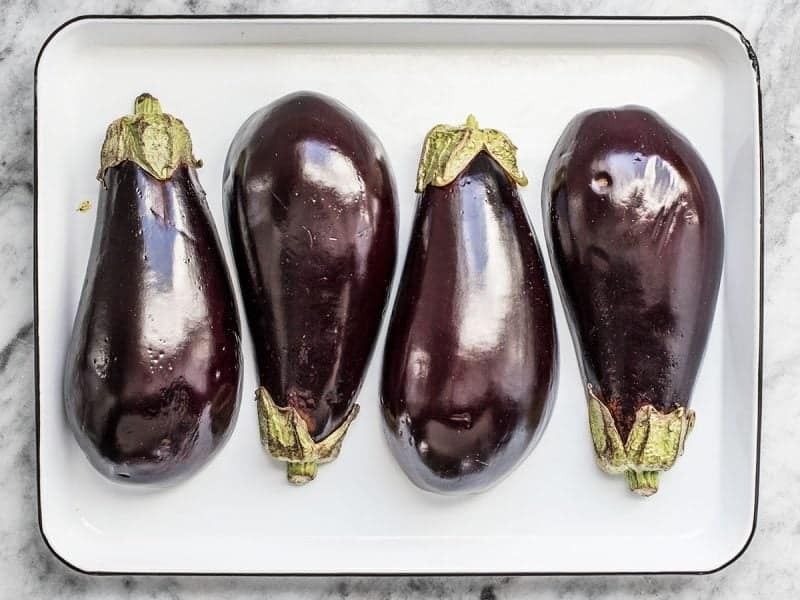 Transfer the eggplant to the oven and roast for about an hour (total time will depend on the size and width of the eggplant). While the eggplant are roasting, begin the meat sauce. Add 1/2 lb. ground beef to a sauce pot with 1 Tbsp olive oil and sauté over medium heat until the beef is browned. If you’re using a higher fat content beef, drain off the excess fat, then add 1 small onion (diced) and 2 Tbsp butter. Continue to sauté until the onion is soft and transparent. Once the onions are soft, add a 28oz. can crushed tomatoes, 1/2 tsp Italian seasoning blend, and some freshly cracked pepper. Stir to combine and allow the sauce to come up to a simmer. Once it reaches a simmer, turn the heat down to low and let it simmer over low for at least a half hour. The longer it simmers, the better it tastes, so I just let it go until the eggplant are done roasting. After the sauce has simmered and you’re just about to serve it, give it a taste and add salt as needed (I added about 1/2 tsp salt). After about an hour, the eggplant should be soft and the skins should appear wrinkly. Carefully flip the eggplant (they’ll be quite soft and wobbly). Look at that beautiful caramelization! And then sprinkle with some grated Parmesan and serve! (I added a little chopped parsley, but only to give the photographs some color). I’ve made this a couple of times now and it is good enough to go on rotation. What a great sauce, and the eggplant gets creamy and delicious. thanks again, Beth, you are awesome. Another winner! More than the sum of its parts. LOVE THIS! I make it at least every other week now. It is so simple and is a great base to be creative with. Also, I never knew how much I love eggplant until I made this. Thank you Beth! This was so yummy!! I used this for a meal prep, and it tasted fine 4 days later. I can’t have dairy because of medical reasons so I replaced the butter with a drizzle of extra Virgin olive oil, and I added mushrooms. And, I know this sounds like a lot of subs, but I used ground turkey instead of chicken or beef because it’s what I had. I’m definitely making this again!! Great recipe. I used grated zucchini instead of meat in the sauce. Trying to do meatless meals. It is so good. It is now a real favorite. Can’t wait to try other recipes. Holy. Moly. I ate this by the spoonful. I added mushrooms in addition to the meat (I chose ground turkey) and it was amazing! I used ghee instead of butter and just as amazed. Nutritional yeast substitute for the parm, man do I miss cheese. This is staying in our rotation, it’s perfect, and made lunch prep for the whole week! This was the first meal I cooked in my new house and it was delicious! I love that you’re starting to include more gluten and grain-free recipes on your site. I’d like to make it again, but am wondering if there is a way that I can either leave the butter out of the sauce or substitute it with something else. I’m supposed to be on a low-fat, low-cholesterol diet in addition to avoiding gluten and cutting down on grains. Before I found this recipe, eggplants were a bit like toddlers to me in that I know they exist but I’m never quite sure what to do with them. I loved how soft they turned out by scoring the flesh beforehand and the meat sauce was a great addition. Not the prettiest of dishes but looks don’t mean a thing when it’s this tasty. I added a bay leaf, a dash of half-n-half and a pinch of sugar to the sauce. Turned out amazing! I made this last night and it was AMAZING! I added a diced green pepper to the meat sauce and probably tripled the amount of seasoning. It makes great leftovers. I will also definitely be using this sauce for future recipes. You could easily substitute whole mushrooms rather than meat or even use half ground beef, half Italian sausage. 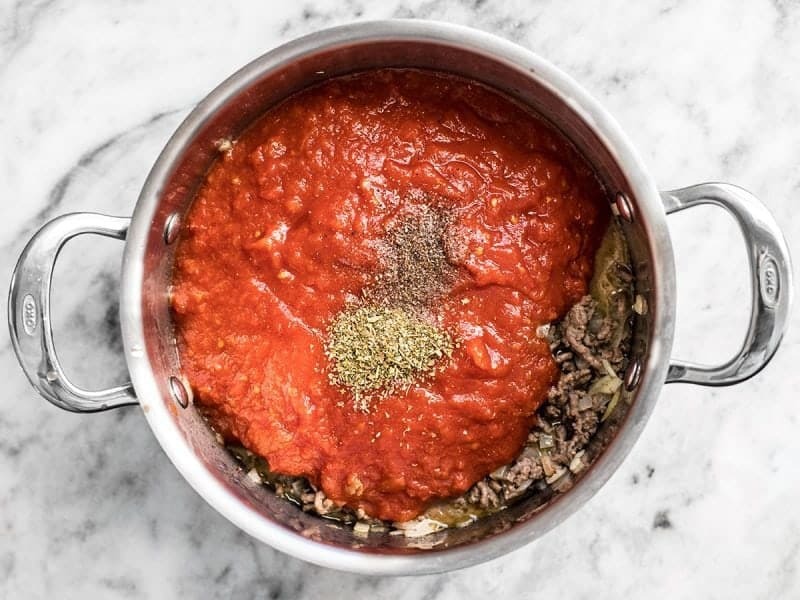 This meat sauce would be great for lasagna or baked ziti. Do you think this will reheat OK for a lunch meal prep? I’ve never cooked eggplant before but I’m trying to eat less carbs. Thanks! This recipe is great! The first time I made it as written and was really impressed which the eggplant itself. The second time I made it I used my mom’s spaghetti sauce recipe which I stewed for several hours and topped with swiss cheese and it was even better. I served it to a crowd with garlic bread and it was a huge hit. For leftovers, I made a little bit of Israeli cous cous to go with it which was great. I can see using the eggplant technique and topping it with a variety of things. Some ideas include alfredo sauce with chicken or just pesto and serving the eggplant as a side dish. Thanks for your website! I use it all the time and have found several things to put in the regular rotation such as this dish. Huge fan of this recipe! I try not to eat a lot of pasta and the eggplant is a delicious (and beautiful alternative). I made a couple of small modifications — using a carton of mushrooms instead of meat and subbing a pinch of basil/oregano/parsley for Italian seasoning — and it turned out beautifully. Adding to my regular rotation. and dang it was so easy to make! My BF who doesn’t like to try ~new~ things LOVED this! Easy and cheap to boot! Will def be making this again! This was amazing! And so easy. Definitely will reuse this sauce recipe, so good. I followed the recipe exactly and it was great, but you can definitely replace the meat with whatever. Yum, I bet meat sauce would be good on portobellos! I don’t know the general cooking times for them, though, so I’d check google.